Florida citrus crops should get a break soon, with temperatures forecast to rise this week. (CNN) -- Higher temperatures are bringing some relief to the Southeast and should remain in place despite stormy weather expected for the coming weekend, weather forecasters said Tuesday. After the stretch of unusually cold weather that gripped the region, severe storms will affect the Gulf Coast of Louisiana, Mississippi, Alabama and most of Florida on Friday evening and Saturday, the National Weather Service said. Cold Arctic air will remain to the north. In Atlanta, Georgia -- where ice from a snowfall last week remains on the ground in some places and weekend temperatures didn't climb out of the 20s -- forecasters predicted a daytime high of 37 degrees Tuesday after a high of 44 on Monday. A gradual warming is predicted through Friday, when the high could reach 58. But overnight lows aren't expected to edge above freezing until Friday night. Several Florida cities have had early morning record lows in the past two days, the weather service said. "Temperatures over the weekend and early Monday morning plunged to levels not seen in 20 years over south Florida in the wake of the arctic cold front which blasted through the region early Saturday," it said. "Temperatures remained at or below 50 degrees for more than 48 consecutive hours, finally rising above 50 during the late morning to midday hours Monday. Although no records are kept of consecutive number of hours at or below 50 degrees, it is likely that this streak is among the longest on record." Key West, which has weather records dating to 1873, recorded its second-lowest temperature of 42 degrees Monday at 4:55 a.m. Its record low was 41 degrees, set January 13, 1981, and January 12, 1886. In northern Florida, Tuesday's high was expected to reach 54 degrees in the state capital, Tallahassee, and temperatures were forecast to increase during the week. Early morning readings Wednesday will be in the high 20s, the weather service said. That is far better than the low of 16 degrees in the city early Monday. The cold weather has damaged Florida's citrus crops, which can't tolerate prolonged temperatures of 28 degrees or below. 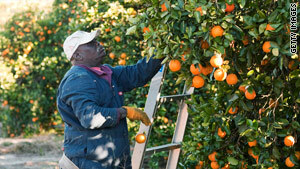 Florida produces three-quarters of the United States' orange crop. Some groves in the northern part of the growing area suffered substantial frost damage Saturday night and Sunday morning, Andrew Meadows, spokesman for Florida Citrus Mutual, said Monday. It will take about five weeks to quantify the losses, he said. But the frigid air was welcome to peach growers in central Texas. According to Jamey Vogel, who owns Vogel Orchard in Stonewall, Texas, just east of Fredericksburg, "Peach trees need chilling hours, which are hours below 45 degrees, and we have been getting a lot of those this year." "We absolutely welcome it," he told CNN affiliate KXAN in Austin. He said he has 9,500 peach trees in his 90-acre family orchard. The trees, which are dormant this time of year, need cold, wet weather to produce a crop. On the West Coast, a storm was rolling into the area between Seattle and San Francisco, with the brunt heading into Northern California, according to CNN meteorologist Rob Marciano. Two to 3 inches of snow was possible in the Sierras, forecasters said.